Flash back to 2012. This future auspOpper was walking to the train station following Lady GaGa’s ‘Born This Way Ball’. As we walked away from the venue, a boom box randomly appeared playing a catchy rock pop song, which we later discovered was called ‘So Contagious’. Next to the boom box were four ballsy yet earnest young guys passing out physical CD singles and fliers to their social media/next gig. We remember being suitably impressed by this marketing strategy, which we had never seen before and haven’t since, as well as by ‘So Contagious’. 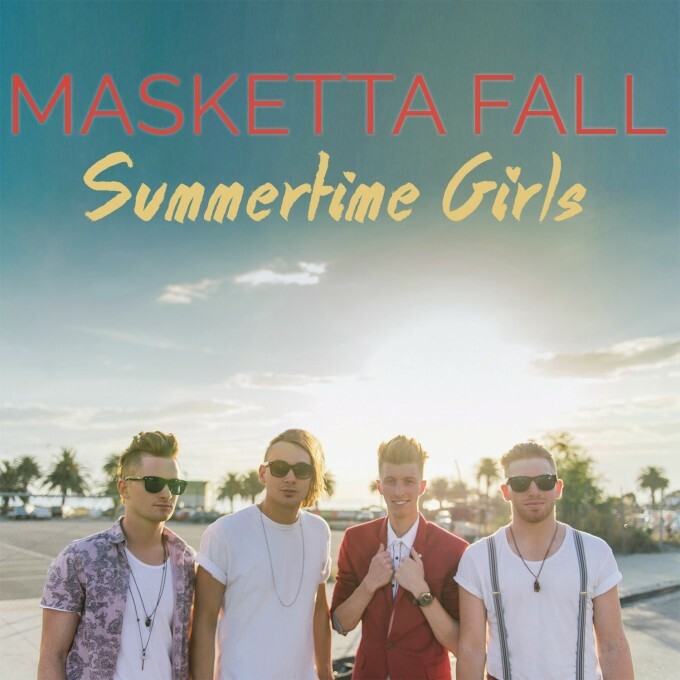 Three years later that very same band, Masketta Fall, are on the verge of becoming the next big Australian music success story. Their single ‘Summertime Girls’ keeps getting radio play and they have recently supported The Vamps on tour, playing to their biggest crowds yet. Brad got the chance to chat with Braden, Ben, Moli and Jamie about their humble beginnings, trying to pick up whist dressed like a 90 year old and the eternally great pop music of JoJo and Nick Lachey. The band’s journey started at a mutual friend’s 16th birthday. “It was funny because everyone’s having their first drink, girls kissing girls, and I’m in the shed with all the parents who were there playing drums to ACDC!” drummer Jamie adds. “Using your drum kit to mask your poor social skills,” singer Braden intercepts. The band initially started out as a rock-punk hybrid, a far cry stylistically from what they are now. After a couple of years, however, the band decided to split up to pursue their post-school career paths. For Ben, who was studying a business degree, this was a critical crossroads. Consequently he called up Jamie to discuss giving music a proper go. That song was ‘Without You’, which, like its opening lyrics suggested, brought the group back to square one. They hit the ground running, promoting their newly written material to anyone who would listen. They followed tours, such as the ‘Born This Way Ball’, nationally (“At very much a big expense to us!” Moli laughs), handing out promo CDs to create some momentum. “Our philosophy has always been getting to the people, play live shows, promote to infinity and be real, not just be an online thing,” Moli explains. That philosophy also included embracing a lighter sound, a move the band insist is authentic and not an indicator of selling out. The band not only embraced a new sound but also decided that they’d need a little help in order to succeed. “We’ve chased a record deal ever since we started the band because we knew that we needed it,” Moli tells us. “The thing is, when you’re an independent pop act, if you don’t have radio support or media then there’s really no way to get to those people without a record company to open those doors for us. ‘Summertime Girls’ is certainly a game changer for the band. Not only did it score the boys a record deal with Universal Music but also it is the band’s most feel good song yet. The boys were certainly onto something, with the song seeing steady radio play over the last few months. The track also comes with an equally charming video clip that pushes a lighter image without being too clichéd. Creativity isn’t always fun; the band spent two hours each day getting into their old man make up for the video, which made things slightly difficult for a love struck Ben. Whilst things moved fast for the boys once Universal come onboard, it took years of hard work to get to where they are now. That said, the band has amassed a staggering four million views on YouTube, but they’re realistic about their social media impact. As a special hidden treat for die-hard fans, the band has kept a number of their early punk-era videos as unlisted on their YouTube profile. These videos are quite surprising given the band’s current clean-cut image, but the boys are unapologetic about what fans might find online. “Everyone’s got a history and it really adds to where we come from,” Moli clarifies. The band have evolved so much that when asked what their guilty pleasure pop favourites are, they declared that there was no such thing. “You know that song ‘Leave’ by JoJo? 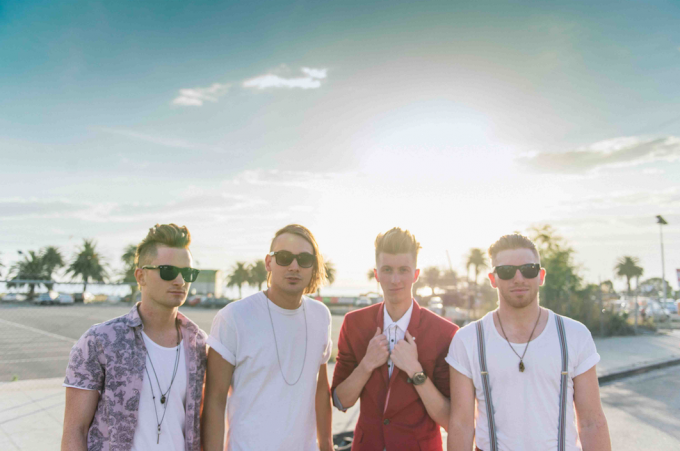 I love that song,” Moli tells us as Ben starts singing the chorus. “I think my favourite pop song is ‘What’s Left Of Me’ by Nick Lachey. That’s a good song,” Braden laughs. “We will listen to top 40 all day everyday,” Moli adds. As mentioned earlier, the boys recently toured with UK sensations The Vamps, in front of the biggest crowds they’ve played to yet. After the tour the boys are due back in the studio to commence work on their first major label album. 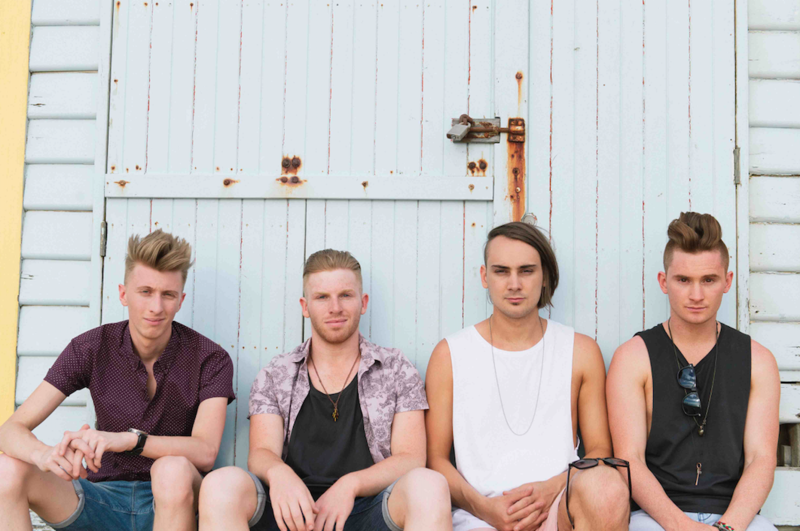 “I think 2015 is a big year of songwriting for us and getting that material,” Ben reveals. The group’s dream is to become a radio mainstay. Summertime Girls is out now. They are not just a band.. They are a full entertianment package. They have given their fans so much in the past, it is good to see them getting something back.